At the start of the year, Blackman's released a blackberry gose. It was perfect timing as the Crafty clan happened to be enjoying a spot of summer camping nearby. Or so we thought. By the time we made it to the brewery mid-afternoon, every single can Renn and his crew had filled had already been picked up by locals. As we said back then, it was a sign of the times if ever there was one: a salty, sour, fruity beer selling out at a regional brewery in hours. Unsurprisingly, they're repeating the trick as summer 2017/18 kicks off, albeit reinventing the trick too. Regular collaborators Barrow Boys joined them again at the brewery and instead of blackberries they opted for blueberries and violets. To top it off, the saltiness was provided by Torquay seawater. 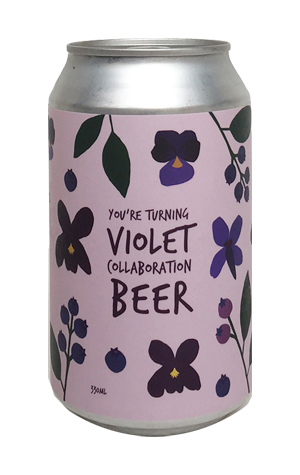 The beer pours a deeper shade of pink than the tinnies in which it comes and offers up a little bit of many things: mostly floral and fruity berry characters plus soft, sweet malts, a touch of saltiness and a hint of acid tang. And it offers them up in a delicate little package likely to disappear as quickly as its predecessor.